February 19, 2015 by Fr. 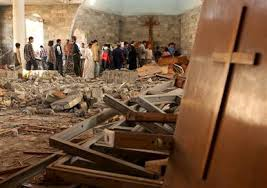 C.
This coming Sunday, the First Sunday in Lent, will include special intentions for persecuted Christians throughout the world, and in particular those suffering at the hands of Islamic terrorists. All are urged to contact their representatives and the White House to respectfully voice our deep concerns for the plight of our brothers and sisters now daily suffering the most vile kinds of martyrdom. The Lenten mite boxes available at Mass will go directly to aid displaced and suffering Christians in the Middle East.